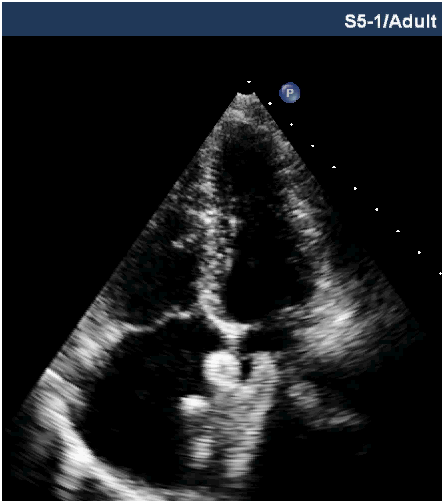 Objective: To analyse the results of percutaneous closure of secundum atrial septal defect by using transthoracic or transesophageal echocardiographic guidance. Place & Duration of Study: Pediatric Cardiology department of Armed forces institute of cardiology/National institute of heart disease (AFIC/NIHD) Rawalpindi Pakistan from Jan 2011to Sep 2014. Subjects & Methods: 425 patients underwent transcatheter closure of secundum atrial septal defect (ASD) during the study period. All patients were evaluated for suitability and device size before procedure in outpatient department (OPD). The patients were divided into two groups depending on the need of echocardiographic guidance during the procedure for device deployment. In group A, transthoracic echocardiography (TTE) while in group B transesophageal echocardiography (TEE) was used as a primary tool for guidance of device deployment during transcatheter closure of secundum ASD. Results: Overall 409/425 (96.2%) patients had successful closure of secundum ASD. The age varied from 2-75 years and 60.5 % (n=257) were female. In group A the success rate remained 98.6% (347/352) while in group B, it was 85% (62/73). The procedural failure rate was 1.4% (n=5) in group A and 15 % (n=11) in group B. The mean procedure time was 35±9SD and 55±28SD minutes in group A and B respectively. The mean fluoroscopic time was 7±5SD minutes in group A and in group B it was 19±16SD minutes. No emergency surgical exploration or death occurred during this period. Conclusion: TTE is an easy, reliable and sufficient guiding imaging tool for transcatheter closure of ASD in selected cases. The procedural and fluoroscopic time was significantly shorter in patients who underwent transcatheter ASD device closure under TTE guidance. Atrial septal defect is one of the most common acyanotic congenital cardiac anomalies and accounts for 8-10% in children and up to 40% in adults [1-3]. In most patients it remained asymptomatic in early age but later on may result in a number of complications including arrhythmias, pulmonary hypertension, heart failure etc so necessitates its closure. The exact defect size, number of defects, rims and its relation with the surrounding structures are helpful in making decision for device closure. [4,5]. Percutaneous closure of secundum atrial septal defect is progressing day by day since 1974 [6-8]. Device closure of secundum atrial septal defect is safe, effective and provides alternative way to surgical repair with shorter hospital stay [9,10]. Transthoracic, transesophageal and intracardiac echocardiography are excellent and standard guiding tools for device deployment. [11-13]. In Pakistan our institution is one of few centres that is providing interventional therapy for various congenital heart defects. We are using both TTE and TEE as guiding tool for percutaneous atrial septal defect closure but not intracardiac echocardiography (ICE) due to non availability and cost constraints . In this study we compared the transthoracic echocardiographic and transesophageal echocardiographic guidance for transcatheter closure of secundum atrial septal defect. All patients with secundum atrial septal defect were assessed in outpatient department and those considered suitable for device closure were enrolled in this study. A detailed TTE was performed in children less than 12 years with good acoustic window for the assessment of defect size, number of defects, total septal length, and adequacy of rims and relation with the surrounding structures. In older patients or in patients with poor acoustic window, TTE was supplemented with TEE in OPD for selection of cases. The occluder size was also decided at the time of pre-procedural assessment of the defect. Secundum atrial septal defect with deficient rims. Atrial septal defect with partial anomalous pulmonary venous connection. Atrial septal defect associated with other complex congenital heart disease. The patients were divided into two groups depending on echocardiographic guidance during device deployment. In group A TTE while in group B TEE was used as guiding tool for device deployment during percutaneous closure of secundum ASD. All patients were called a day before the procedure and clinical examination with complete blood count and chest X-Ray was done to rule out infection. An approval from ethical committee of the institution as well as written consent was taken before the procedure. The procedure was carried out with local or general anaesthesia. The device was deployed in a standard fashion under fluoroscopic and echocardiographic guidance. In some patients additional techniques including balloon assistance, dialator support or pull through were required for device deployment. The device position and residual leak was confirmed with TTE or TEE before the release of device (Figure 1 & 2). All patients were given I/V heparin 100u/kg and first dose of antibiotics (ceftriaxone) 50mg/kg during the procedure followed by two additional doses. The patients were discharged after 24 hours and TTE was performed at the time of discharge. The patients were advised aspirin 5mg/kg for six months and regular follow ups at 1,3 & 6 months. Figure 1: Showing well placed device under TEE guidance. 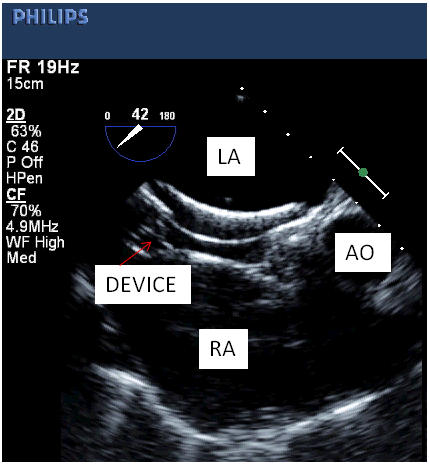 Figure 2: Transthoracic echocardiography showing well placed device. The overall 409/425 (96.2%) had successful device closure of secundum atrial septal defect including 60.5% (n=257) female and 39.5% (n=168) were male. The age of patients varied from 2 to 75 years (mean 21±16SD). TTE guidance was used in 352 (82.8%) patients and TEE in 17.2% (n=73) patients for device deployment during the procedure. 98.6% (347/352) patients had successful closure under transthoracic guidance. The age of patients varies from 2-75 years (mean20±17SD). The procedure was carried out with deep sedation along with local anaesthesia in 65% (n=229) patients while in 123 (35%) patients general anaesthesia was used. The defect size ranged from 4-38mm (mean18±7SD) and the occluders used varies from 5-40mm (mean21±8SD) (Table 1). The sizing balloon with stop flow technique was used for defect size measurement in 31 (8.8%) patients. The balloon assistance technique for device deployment used in 11(3%) and dilator was used in 2 patients to support the device during deployment. A 20.4% (n=72) patients had absent aortic rim (anterosuperior) as also noted by Li GS et al. and the defects were closed successfully without any complication in all these patients. Table 1: Showing the demographic Variables of both groups. One patient (7.6 years) with 10mm secundum ASD, severe mitral stenosis and kyphoscoliosis, underwent successful percutaneous transmitral commissurotomy (MPG reduced from 21 to 10 mmHg without any acute mitral regurgitation) and device (12mm) closure of secundum ASD. The defect was closed with fenestrated device in three patients due to moderate pulmonary hypertension. In 4 patients with two defects were successfully closed with two devices while in 2 patients the two defects were closed with single device and there was no residual leak. In two patients as the devices appeared oversize and obstructing the atrioventricular valves so the devices were replaced with smaller one. The procedural failure was 1.4% (n=5) including immediate device embolization (n=2), profound bradycardia (n=1) and the procedure was abandoned. In two patients TTE was replaced with TEE for guidance but we remained unsuccessful to deploy the device even with multiple attempts due to thin floppy rims. The other complications were residual leak (n=4) transient heart block (n=2) which settled immediately without medication, difficult deployment (n=4), cobra formation (n=3) bronchospasm (n=1) and pulmonary oedema (n=1). The mean procedure time was 35±9 minutes (20-95minutes) and the mean fluoroscopic time was 7±5 minutes (1.50-45minutes). The success rate was 85% (62/73) in this group. The age of patients ranged from 4-60 years (mean26±15SD). The mean defect size was 26mm (7-40mm) and the device used ranged 10-46mm (mean30±7SD) (Table 1). The sizing balloon with stop flow technique used for measurement of defect size in 35.6% (n=26) and the balloon assistance technique was used in 15 patients (20%) for device deployment. There were two large defects in 3 patients that were closed with 2 occluders while in 2 patients the defect were close to each other and closed with single device. One patient with interrupted IVC underwent device closure with transhepatic approach under TEE guidance. The largest fenestrated device (46mm) ever used in Pakistan was deployed successfully under TEE guidance with balloon assistance technique. The procedural failure rate was 11/73(15%), with device embolization (n=4), unable to deploy the device even with multiple attempts with different techniques (n=7) due to attenuated (≈3mm) IVC rim. The mean procedure time was 55±28mm (25-150minutes) and fluoroscopic time 19±16minutes (2-85minutes). There were no major complications like cardiac tamponade, thromboembolism, emergency surgical exploration or death during this study period. TTE guidance for device closure of secundum ASD is an easy, convenient for the operator and comfortable for patient  as noted in our study with success rate 98.6%. Device deployment is a key event and the echocardiographic guidance to the operator plays important role. An experienced physician can confidently guide the operator for the deployment of device and its stability. A number of imaging tools are available for guidance of transcatheter device closure of secundum atrial septal defect including transthoracic, transesophageal and intracardiac echocardiography (ICE). TEE remained useful, standard and old practice for measurement of defect size and confirming successful deployment of device closure of secundum atrial septal defect in many centres [17-19]. Some authors are even convinced that TEE can be used without fluoroscopy as it provides good views and easy to handle . In the recent years ICE being used in a number of centres having advantage to image postero-inferior portion of septum over TEE and also eliminate the use of general anaesthesia and its related complication [12,21]. ICE is being used in most centres but currently we are not using it due to non availability and high cost . A number of factors influence the image quality by TTE including age, obesity, intercostal space, and thoracic deformity as the patients in our study varying from 2-75 years of age with variable physique and we did not find any difficulty. TTE can be used safely even in patients with complex atrial septal defects with good acoustic window as in four patients we deployed two devices. It provides accurate anatomy of the defect in most patient including adults and avoids the complications of general anaesthesia and endotracheal intubation . TTE is sufficient and safe in patients in some clinical situations in which TEE is impossible due to mechanical and anatomical reasons like oesophageal atresia or strictures . TTE may be a reliable guiding tool for estimation of occluder size as well as guidance for device deployment in young children . A number of international studies support the use of TTE as guiding tool as it helps in reducing the procedural time as documented in our study [21,24,25]. There was significant difference in procedure time (mean time 35 vs 55minutes, p-value .0001) and fluoroscopic time (mean 7vs19minutes, p-value .0001) in group A and B respectively. In this way by using TTE guidance we can decrease the radiation exposure to the operator, staff and patient without compromising on final outcome. Erdem A et al. compared the two groups and concluded that the procedure and fluoroscopic time with TTE guidance was significantly shorter as compared with TEE guidance for device closure. Li GS et al. successfully closed all atrial septal defects under guidance of TTE but the study comprises small number of patient. We were also concerned about the total cost of the procedure so where ever feasible and comfortable for patient we did the procedure with deep sedation and local anaesthesia (group A 65%) and saved general anaesthesia fee approximately 200-250 US$ per procedure which is quite significant for our patients. So by using TTE guidance and local anaesthesia for the procedure we can reduce the financial burden on patient without compromising the quality of procedure. The success rate in our study was 98.6% which is comparable with a number of international studies [8-10]. The procedural failure rate in group A was 1.4% (n=5) and there was no pericardial effusion, thrombo-embolism or death in our study. Yared K et al. conducted a large study and found 1.5% major complications including death, tamponade, fatal pulmonary embolism, need for urgent surgery, and transfusion . There are certain risk factors late device erosion of aortic root and left atrial wall. In Amin Z et al. concluded risk factors deficient rims, oversized device and others included splaying of the atrial disks across the aortic root and extreme movement of the deployed device before release relates to the potential for abrasion of the atrial or aortic wall by the device . Considering this long-term complication of aortic erosion, the two oversized device were replaced with smaller one (group A) and deployed under guidance of TTE with satisfactory results. We think that TTE is safe and comfortable for patient so it can be used as a reliable guidance imaging tool for transcatheter closure of ASD in selected patients. TTE is an easy, reliable, safe and sufficient imaging tool for guidance of device closure of secundum ASD in selected patients. It saves the procedure time and reduces risks of radiation exposure. van der Linde D, Konings EE, Slager MA, Witsenburg M, Helbing WA, et al. (2011) Birth prevalence of congenital heart disease worldwide: a systematic review and meta-analysis. J Am Coll Cardiol 58(21): 2241-2247. Therrien J, Webb G (2003) Clinical update on adults with congenital heart disease. Lancet 362(9392): 1305-1313. Porter CJ, Edwards WD (2008) Atrial Septal Defects. In: Allen HD & Driscoll DJ (Eds. ), Moss and Adams' Heart Disease in Infants, Children, and Adolescents: Including the Fetus and Young Adults. (7th edn), Lippincott Williams & Wilkins, pp. 632. Libby P, Bonow OR, Zipes DP, Douglas LM (2007) Braunwald’s heart disease: a textbook of cardiovascular medicine. (8th edn), Saunders-Elsevier, Philadelphia, USA, pp. 1577-1580. Du ZD, Koenig P, Cao QL, Waight D, Heitschmidt M, et al. (2002) Comparison of transcatheter closure of secundum atrial septal defect using the Amplatzer septal occluder associated with deficient versus sufficient rims.AmJ Cardiol 90(8): 865-869. King TD, Mills NL (1974) Non operative closure of atrial septal defects. Surgery 75(3): 383-388. Latson LA, Zahn EM, Wilson N (2000) Helex septal occluder for closure of atrial septal defects. Curr Interv Cardiol Rep 2(3): 268-273. Chan KC, Godman MJ, Walsh K, Wilson N, Redington A, et al. (1999) Transcatheter closure of Atrial septal defect, interatrial communication with a new self expandingNitinol double disc device (Amplazter septal occluders): Multicentre K Experience. Heart 82(3): 300-306. Du ZD, Hijazi ZM, Kleinman CS, Silverman NH, Larntz K, et al. (2002) Comparison between transcatheter and surgical closure of secundum atrial septal defect in children and adults: results of a multicenter nonrandomized trial. J Am Coll Cardiol 39(11): 1836-1844. Suchon E, Pieculewicz M, Tracz W, Przewlocki T, Sadowski J, et al. (2009) Transcatheter closure as an alternative and equivalent method to the surgical treatment of atrial septal defect in adults: comparison of early and late result. Med Sci Monit 15(12): 612-617. Patel A, Cao QL, Koenig PR (2006) Intracardiac echocardiography to guide closure of atrial septal defects in children less than 15 kilograms. Catheter Cardiovasc Interv 68(2): 287-289. Hijazi Z1, Wang Z, Cao Q, Koenig P, Waight D, et al. (2001) Transcatheter closure of atrial septal defects and patent foramen ovale under intracardiac echocardiographic guidance: feasibility and comparison with transesophageal echocardiography. Catheter Cardiovasc Interv 52(2): 194-199. Ayres NA, Miller-Hance W, Fyfe DA, Stevenson JG, Sahn DJ, et al. (2005) Indications and guidelines for performance of transesophageal echocardiography in the patient with pediatric acquired or congenital heart disease: report from the task force of the Pediatric Council of the American Society of Echocardiography. J Am SocEchocardiogr 18(1): 91-98. Alboliras ET, Hijazi ZM (2004) Comparison of costs of intracardiac echocardiography and transesophageal echocardiography in monitoring percutaneous device closure of atrial septal defect in children and adults. Am J Cardiol 94(5): 690-692. Li GS, Kong GM, Ji QS, Li JF, Chen YG, et al. (2008) Reliability of transthoracic echocardiography in estimating the size of Amplatzer septal occluder and guiding percutaneous closure of atrial septal defects. Chin Med J 121(11): 973-976. Cao QL, Du ZD, Joseph A, Koenig P, Heitschmidt M, et al. (2001) Immediate and six-month results of the profile of the Amplatzer septal occluder as assessed by transesophageal echocardiography. Am J Cardiol 88(7): 754-759. Tseng HC, Hsiao PN, Lin YH, Wang JK, Tsai SK (2000) Transesophageal echocardiographic monitoring for transcatheter closure of atrial septal defect. J Formos Med Assoc 99(9): 684-688. Mazic U, Gavora P, Masura J (2001) The role of transesophageal echocardiography in transcatheter closure of secundum atrial septal defects by the Amplatzer septal occluder. Am Heart J 142(3): 482-488. Earing MG, Cabalka AK, Seward JB, Bruce CJ, Reeder GS, et al. (2004) Intracardiac echocardiographic guidance during transcatheter device closure of atrial septal defect and patent foramen ovale. Mayo Clin Proc 79(1): 24-34. Erdem A, Sarıtas T, Zeybek C, Yucel IK, Erol N, et al. (2013) Transthoracic echocardiographic guidance during transcatheter closure of atrial septal defects in children and adults. Int J Cardiovasc Imaging 29(1): 53-61. Zaqout M, Suys B, De Wilde H, De Wolf D (2009) Transthoracic echocardiography guidance of transcatheter atrial septal defect closure in children. Pediatr Cardiol 30(7): 992-994. Sadiq N, Ullah M, Sultan M, Akhtar K (2014) Transthoracic echocardiography as a measuring and guiding tool for transcatheter device closure of secundum atrial septal defect in young children. J Invasive Cardiol 26(6): 245-248. Kardon RE, Sokoloski MC, Levi DS, Perry JS, Schneider DJ, et al. (2004) Transthoracic echocardiographic guidance of transcatheter atrial septal defect closure. Am J Cardiol 94(2): 256-260. Snyder CS, Moodie D (2009) 5th World Congress of Pediatric Cardiology and Cardiac Surgery, Cairns Convention Center, Queensland, Australia. Congenit Heart Dis 4(5): 391-393. Yared K, Baggish AL, Solis J, Durst R, Passeri JJ, et al. (2009) Echocardiographic Assessment of Percutaneous Patent Foramen Ovale and Atrial Septal Defect Closure Complications. Circulation: Cardiovascular Imaging 2(2): 141-149. Amin Z, Hijazi ZM, Bass JL, Cheatham JP, Hellenbrand WE, et al. (2004) Erosion of Amplatzer septal occluder device after closure of secundum atrial septal defects: review of registry of complications and recommendations to minimize future risk. Catheter Cardiovasc Interv 63(4): 496-502.